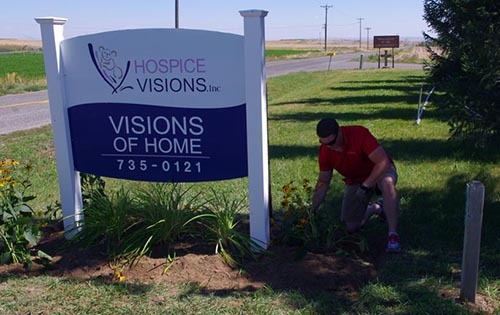 Our "Visions of Home" hospice home, located on land leased from the Monastery of the Ascension in the heart of the Magic Valley, offers residential care for individuals with a life-limiting illness who are unable to stay in their home. This hospice home is able to care for up to two patients at a time and has 24 hour staff to provide around-the-clock care, in addition to a guest room for family members who wish to stay at the home with their loved one. Hospice Visions, Inc. provides hospice care in this peaceful, quiet, home-like environment as if it were the patient’s own home. Since being built in 2003, our “Visions of Home” hospice home has served many patients and their loved ones. Hospice homes are beneficial in a community during times when the progression of an illness becomes more than a caregiver can handle at home. Hospice homes offer needed respite when the caregiver needs time away to prevent his or her own exhaustion. For those patients with adequate support systems and living arrangements, hospice care at home services are ideal. However, more and more Magic Valley residents find that receiving hospice care in their homes is not possible because they lack either a family or friend support network, or because their home is not suitable for the dying experience. Numerous reasons include an economic downturn, limited resources, no available caregiver, and caregiver fatigue, in addition to financial burdens faced by the growing number of uninsured and indigent patients in the Magic Valley. These situations are increasing as older parents find their children moving away for educational or economic opportunities. If you are experiencing any of these caregiver difficulties please do not hesitate to contact us at 208-735-0121 for more information about our "Visions of Home" hospice home.